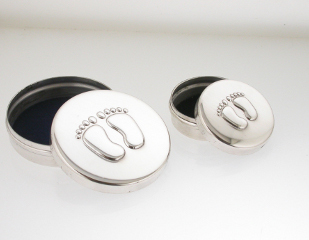 Free Personalisation on this beautiful silver box: A beautiful and hand made sterling silver box, featuring two little baby feet, to hold the baby's tooth. The baby's first tooth box will make a great gift for any new arrival, Mammy or Daddy, God parent or Grand parent or any one who loves children, although I have made the larger version of this design for my boy he is not old enough yet to have lost his first tooth but once he does I shall put his tooth in here and keep it to show him when he is at his 21st Birthday. We can personalise the silver baby's first tooth box for free with the name and date of your choice. The hand made first tooth box is detailed by hand with the two little feet, the finish on the sterling silver box can be retained using a soft silver polishing cloth. Each first curl box is approx. 3cm diameter and 1.5cm tall. The first tooth box is the smaller box from a range of two boxes, the other item is our first curl box and is a larger size.